For a couple of years, Phil and Jackie have been planning to walk to the full length of the KalHaven trail. Yesterday, they did it. And I got to drive the support vehicle, which was a lot of fun. I dropped them off at the eastern trailhead around 7am and then drove to Meijers to pick up the supplies for a picnic lunch -- and to fill a cooler with ice and water bottles. Fully loaded with supplies, I drove to Mentha, which is about 6 miles into the trail. I arrived around 8:30 and settled myself into a new foldable director's chair I also picked up at the store. At first, I was straining my eyes to see them in the distance: you can probably see better than a half-mile along the trail at that point. Then I remembered I had my binoculars with me. It was quite pleasant to sit out in the cool weather and wait for them to arrive. I saw some bunnies and a vole. And the ubiquitous Red-winged Blackbirds. I could hear the sound of water from the drainage system -- Mentha has a very interesting history. In fact, I only had to wait 20 minutes or so until I spotted them walking briskly from the east. They got some water, adjusted their shoes and gear and then headed out again. 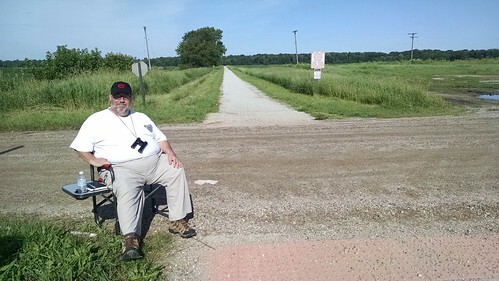 One of my plans was to try to kill green Ingress portals to clear green fields and links crossing the KalHaven trail. This was not a very serious goal, but I stopped in Pine Grove to kill a portal that was anchoring several links and fields and then, when I got to Gobles, I captured three portals and constructed a blue field that was over our picnic table (or very close to it, anyway). 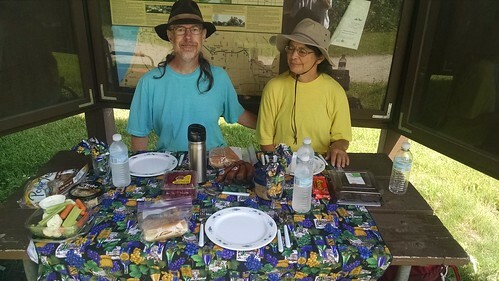 That taken care of, I set up the picnic I had prepared on a table right along the trail. Many years ago, Richard and Katy gave Philip and I each fancy picnic kits. With Alisa's help to track ours down -- and Lucy's help to wash everything -- I had that to use to lay out the spread. So we had a nice table cloth with matching napkins, plates, silverware, and glasses. Phil and Jackie had made their own sandwiches before we left, but I picked up some crudite, raspberries, red bananas, hummus and pita bread, german potato salad, and brownies -- for after. Before they pushed on, Phil gave me a bunch of additional Ingress items (bursters and resonators), so I spent another hour in Gobles walking around smashing more portals and linking them up to the field I'd already created. 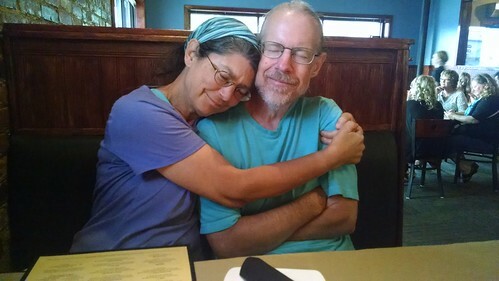 I spent the rest of the afternoon much the same way: I drove ahead to Bloomingdale, Grand Junction, Lakota, and South Haven to see where the trail crossed and find a likely spot to hang out at the appropriate time for Phil and Jackie to check in and get more water and snacks. Finally, approaching 8pm, they completed their walk. I picked them up and we went to the Taste in South Haven. I dropped them off at the restaurant, so they wouldn't have to walk anymore and then went off to park the car. The South Haven "Harborfest" is going on so it took me a while but, by the time I returned they were seated and we had some drinks and dinner. It was a great day and a lot of fun to be a part of. I realized it was perfect to have something to do, to have a sense of purpose and engagement, but something that didn't really require much effort or difficult -- and which gave me an excuse to not be doing something else more productive. I've suggested that Phil and Jackie try to get sponsorships to do other long walks in exotic places like, say, New Zealand, that would pay for their expenses -- and for someone to drive their support vehicle. Update: Phil has now posted about the hike.